Media Effects Artist: Halloween : Safety Inspector : "hand over your candy for inspection please"
Halloween : Safety Inspector : "hand over your candy for inspection please"
IMGP1078, originally uploaded by hal(var). It's a toy miner helmet I found at our local super random discount store, south pole, so some folks took him to be a MTA employee not a Construction worker as we intended, but I think Mr Danger would have been even more excited if he thought it had something to do with trains. But I don't think he's got that level of detail down, I had thought to try and put MTA on the hat, and make him one of those MTA lanterns, maybe later I'll attempt that if it interest him. IMGP1086, originally uploaded by hal(var). 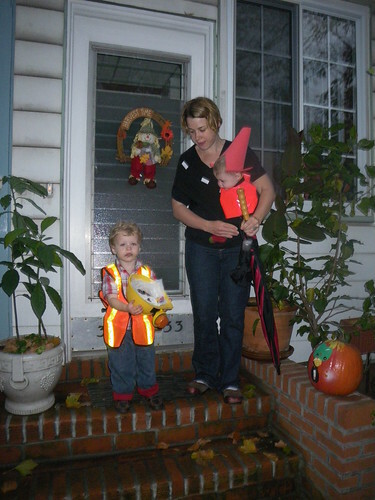 though it is impossible to get everyone face at the same time here's the best family costume pic: here we go embarking on the trick or treat adventure, Bert didn't really get it yet, he just wanted to eat that first pack of M&M's. Actually he never really understood why you would just put the candy in the bag; you have candy you eat it, then maybe you go get some more. IMGP1090, originally uploaded by hal(var). 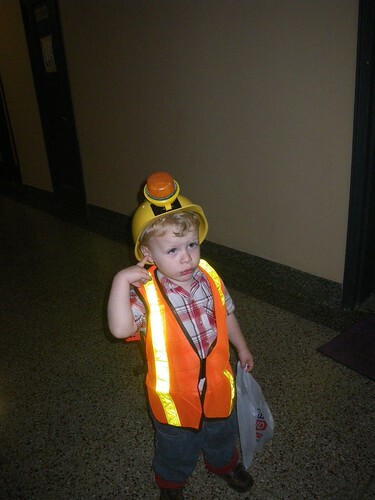 Bertram was not that into wearing his hat, so we started using it to collect candy. As you might see it's a family costume, though Daddy didn't manage to get in on it this night. 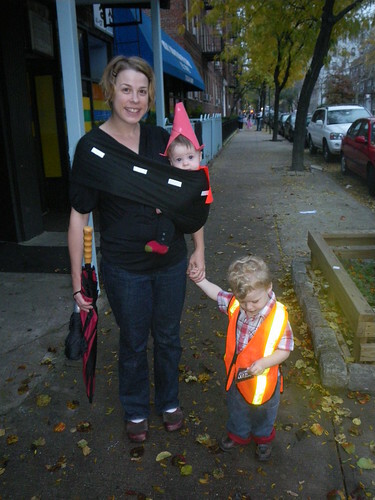 Or in case you can't tell, Vivian is a traffic cone, and Rachel is the road. I was a traffic cone the week before, but tonight I was considered the pot-hole. And as you can see in no photos is he holding his flag. Bertram was so into watching the construction workers 43rd ave this summer, and spent many mornings just watching that one of the construction workers gave him his flag. It was fairly large for Mr Bert and on a long hard dowel, so for the costume Rachel make him a scaled down version that was very fun for Bert to waive, but that was it's own game separate from the going out apparently. But Vivian's big is also made from that flag fabric. We only did about half a street but it was more than enough loot for Mr Danger. I mean he surely would have kept going but didn't need the candy and did need the rest.